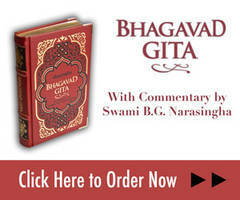 There are four Vedas, and it is taken that the Rg Veda is the principal one. Veda means knowledge and it has two major divisions – material and spiritual. There is the mundane knowledge of this phenomenal world and there is the spiritual or transcendental knowledge that is called in Sanskrit sabda-brahma, or knowledge of that which lies beyond the senses. In the modern world people are very busy with sensual knowledge – that which they can acquire through experimentation, what they acquire through touch, sight etc. Knowledge about transcendence is almost an imaginary thing in society. In other words, people doubt that it actually exists. When people want higher knowledge they look towards the heavens; they want to know something about life on other planets, life in another galaxy, but this is also within the mundane world. The desire to know something about life up there is also mundane because that is within the material sky. Transcendental knowledge lies beyond the material sky in the spiritual sky. The Vedas deals with all knowledge – mundane and transcendental. To a certain extent we may discover mundane knowledge without the help of the Vedas. For example in the Vedas there are many references to flying machines and even inter-planetary travel and communication. Nowadays we have airplanes, rockets, space shuttles etc. All this is happening by man's own endeavor. First the Wright brothers invented the first airplane, and in time man traveled into space. Man is doing all of this without any reference to the Vedas. However, long before man even dreamt of flying, flying was there in the Vedas. But man has learnt to fly without directly approaching the Vedas. Thus, to a certain extent, material knowledge can be gained by ones own endeavor. The Vedas also inform us that there is life on other planets, but at present we have not discovered that by our own efforts. Yet the proposal is there. You can save so much time if you accept Vedic knowledge. Why should we accept Vedic knowledge? The Vedic knowledge says there is life on other planets. Why should you accept that? Because it is quite logical. The Vedas proposed flying machines and inter-planetary travel thousands of years ago and now you have to come to know that is possible. So why should you reject the other proposal made by the Vedas that life is there on other planets? First accept that there is life on other planets. Whether you can contact that life or not is another question. But you can answer that primary question, "Yes, there is life on other planets, there is life throughout the universe." According to the Vedic knowledge of the universe, there is no place where life does not exist, and that life is in many variegated forms. Yet we struggle with the principle of accepting a higher authority and therefore we want to know everything through our own hard work, experiments and research. We doubt the proposal that life exists throughout the universe, then for many years we presume that life can only exist in certain limited circumstances – that we can only find life here on this planet. If it is too hot, like on the sun, then how is it possible for life to exist there? If it is too cold, like the moon, then how is it possible for life to exist there? But then we discover that within our own world, deep within a volcano in the ocean, where the water is thousands of degrees – a place where we could never have imagined anything living before – some life-form can live within that extreme circumstance. So life exists in all places regardless of how extreme the environment may be. We may have experience of that – we may not. But through the Vedas we can know what is not knowable to us in this world. As I said, to a certain degree we may gain knowledge of this world by our own endeavor. But as regards transcendence, as regards that which is beyond the material field, that which is beyond the material sky, which is lying within the spiritual sky and is unknown and unknowable, the only means is the Vedic authorities, the Veda itself and the parampara. Parampara means the guru-disciple succession – a continuous line running for thousands of years that receives higher knowledge and cultivates the practices of sadhana, the practices to attain a higher realization. Only through this method can that which is beyond this world become known to us. This way of experience is actually far more substantial than how we experience the world today. How do you experience the world today? You touch it. You see it. You hear it. You want to have some reciprocation with it. By doing these things you are sure that it exists. The spiritual world, the experience of transcendence, has more reality than that. In the morning we wake up and see the sun rising on the horizon. When knowledge of transcendence awakens in the heart, it is a more substantial experience than seeing the sun rise. Those who are great sages, who are great mountains of realized knowledge so to speak, have a higher consciousness. They say that that transcendental world is the only reality and everything in this phenomenal world, eventually vanishes. So, the primary interest of a human being should be to journey towards transcendence and discover what is beyond this world. Visnu means the Supreme Person. The Absolute Truth is ultimately a person, a divine entity. His lotus feet are the most negligible part, the lowest part of His transcendental form and they are above all in this world. They are like the sun that passes in the sky. The sun is seeing all and blessing all. 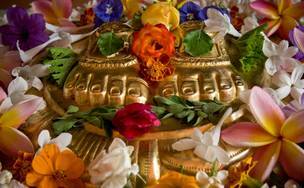 Similarly the lotus feet of the Supreme Lord are above all in this world, seeing all and blessing everyone. Before any work is performed, before any activity is taken up, the Vedic way is to remember the lotus feet of Visnu. We are moving under the watchful eye of the Supreme Lord at all times – we are under His glance, we are under His care, we are under His guardianship. Therefore there is no need for fear. Fear in the Vedas is called bhaya. In varying degrees everyone is fearful in this world. Because of fear so much suffering is there. But there is no need of fear if we always remember that above everything the Supreme Lord is there, the Supreme controller. His watchful eye, His grace is always upon us. If we remember this then there is no need of fear and one can live life free from anxiety. How to approach transcendence? That is the main subject of the Vedas. For those who are not ready to accept transcendence, for those who are not ready to accept the guardianship of the Supreme Lord, there are many other departments of knowledge to help in this temporary life. And gradually they may awaken to understand the ultimate value of human life. Ancient Vedic civilization based itself on the transcendental goal, not on material achievements. Temples were grand and gorgeous whist people’s homes were very simple. Why did they live like that? We look back on them now and wonder that if they had the ability to build such marvelous wonders in stone, why didn’t they build homes for themselves that would last for hundreds of years? It is because they knew that ultimately this world is not our home. The temple represents transcendence –the abode of the Supreme Lord. That is grand and glorious. That will stand forever. But our life? Thousands upon millions of us we will simply come and go. This world is not our home – we cannot stay here forever. They applied this idea practically and lived very simply. Why do you want to build a home here? You cannot remain here forever. You have to fix your gaze, your consciousness, on the higher world and pass this life in a simple manner. At the end, when our body falls into the dust or is consigned to flames, our eternal consciousness will reach that transcendental world. The Vedic people lived by the conception that the Supreme Absolute Truth, Visnu or Krsna, is always above all. In this way they lived happily.